I had not been back to St Nicholas for nearly eight years. 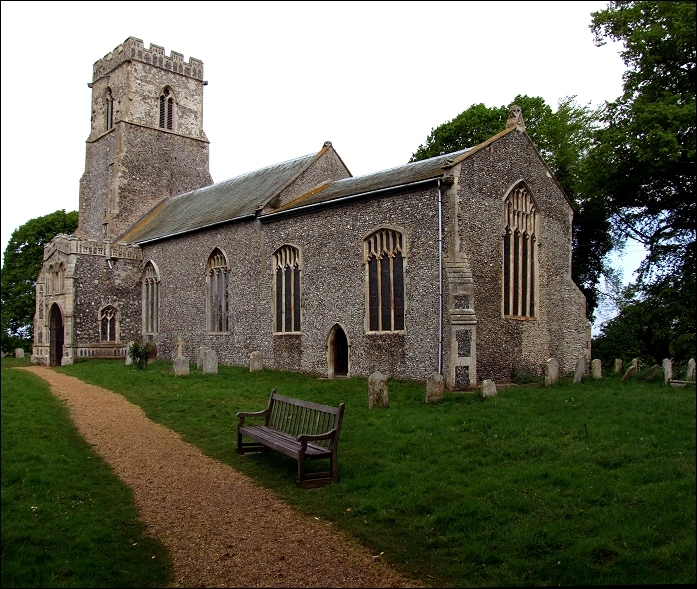 It is a beautiful, rolling parish on the banks of the Waveney, sparsely populated and little-visited, although the church will be familiar to thousands of drivers, being visible on its hill from the main Diss to Yarmouth road which runs about half a mile to the north on the Norfolk side of the border. 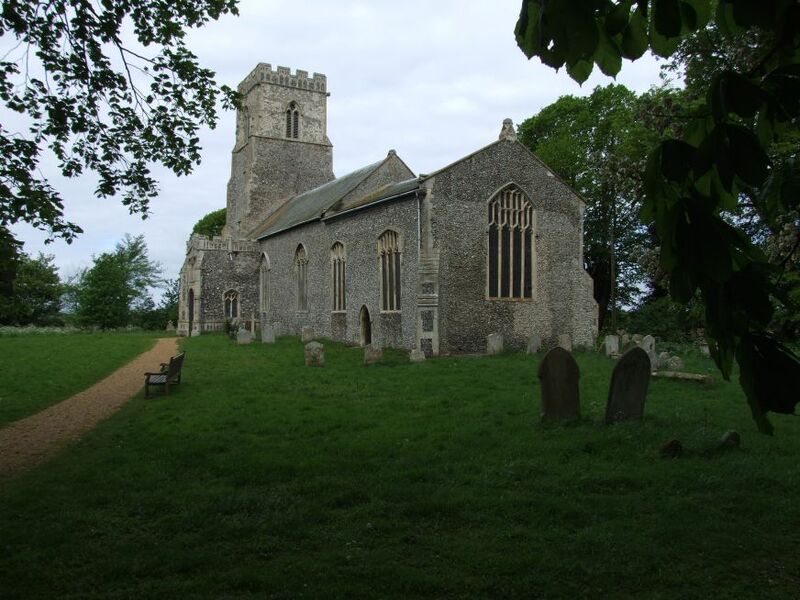 I had originally visited all these lovely north Suffolk churches by bike back in the late 1990s, at a time when they were all kept locked, the keyholders often distant enough to make the journey to get the key a depressing and frustrating experience. But in the last few months I have had a number of cheery e-mails from other church explorers who had found them all open and thriving. It must be said that it would be hard to describe a place like Oakley as thriving; it is such a profoundly sleepy place. The church sits alone in the fields with just one house for company, the graveyard tree-shrouded and silent apart from the birds. It feels a very long way from the 21st century, and it seemed incredible that we were less than a hundred miles from the centre of London. The church looks bigger than it is. 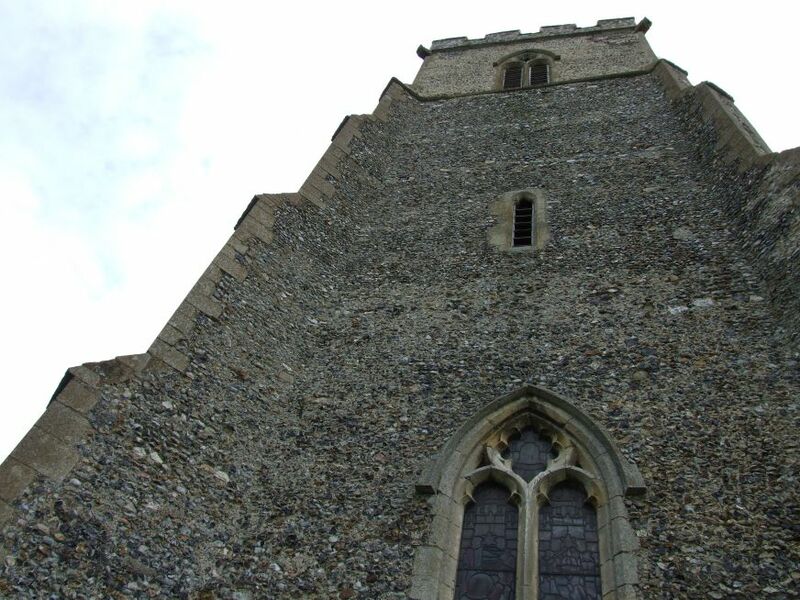 The 14th century tower and 15th century porch are fmiliar from hundreds of other East Anglian churches, but there are no aisles, no clerestory. This is a simple church made to look grand by the enthusiasms of confident ages. The porch at one time had two storeys, but the floor has now gone. There is a nice collection of medieval fragments in the side windows, and some good 1960s glass up in the parvise. The medieval glass includes the top part of a St Christopher carrying the Christchild on his shoulders, a Priest, and the head of Christ as the Man of Sorrows. 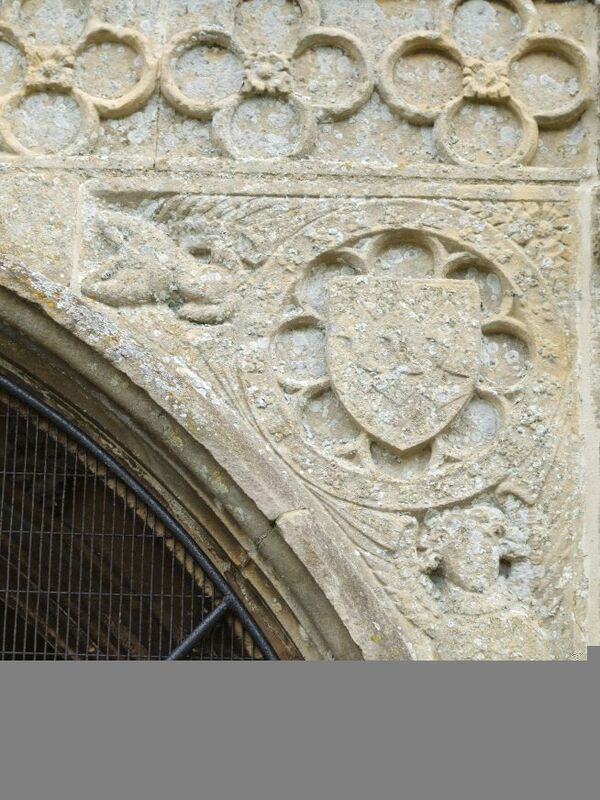 best of all, I liked the 15th century primrose, which so easily could have been copied from the life in this churchyard. For centuries, Oakley has been a joint parish with neighbouring Brome. It seems to have been a wealthy benefice; when George Paterson was Rector here for forty years in the 19th century, he was receiving more than £650 a year, something like £130,000 in todays money. By the 1860s, he was contributing some of his millions to the rebuilding of Brome church, the work of the great Thomas Jekyll. Incidentally, the 1851 Census of Religious Worship is revealing about Brome and Oakley. 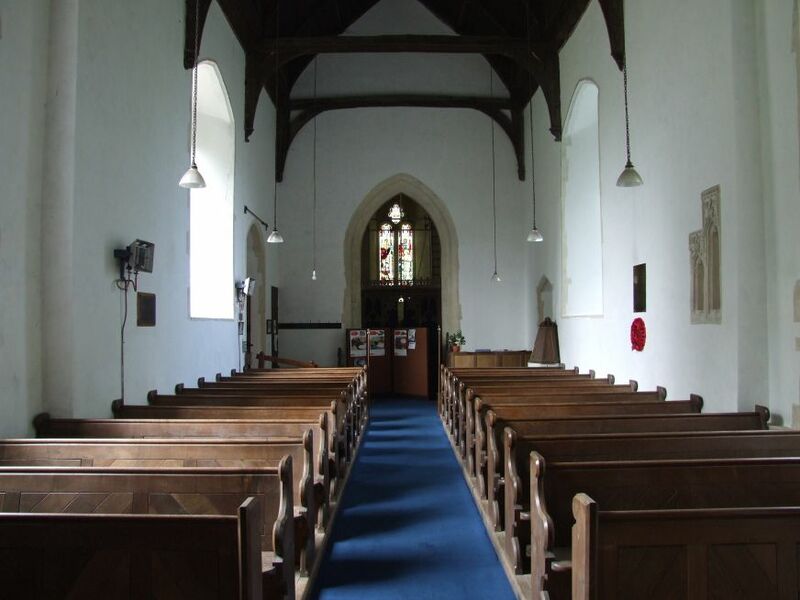 The combined parishes had a population of 650, and a regular Sunday morning attendance of just over a hundred - the two churches alternated weekly in holding morning and evening services. 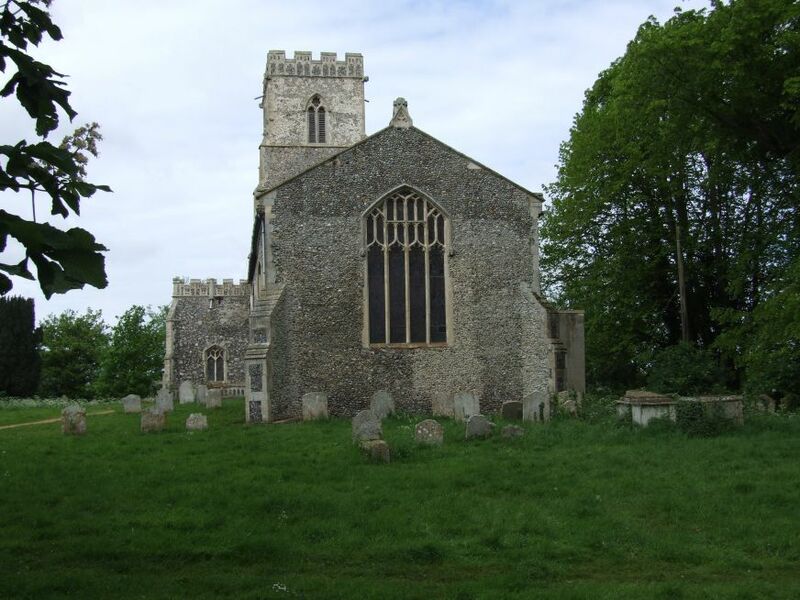 That means about one in six of the population were attending the parish church on a Sunday morning, which is well above average for East Anglia, where it was usually about one in ten. 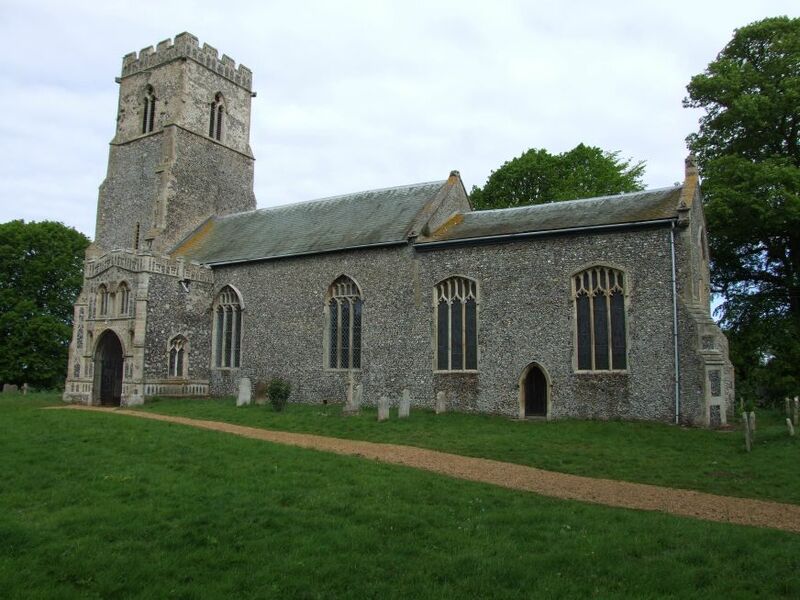 This was because of the enthusiasm in Norfolk and especially Suffolk for non-conformism - Congregational, Baptist and Methodist chapels often attracted bigger congregations. However, there was nothing like that here. 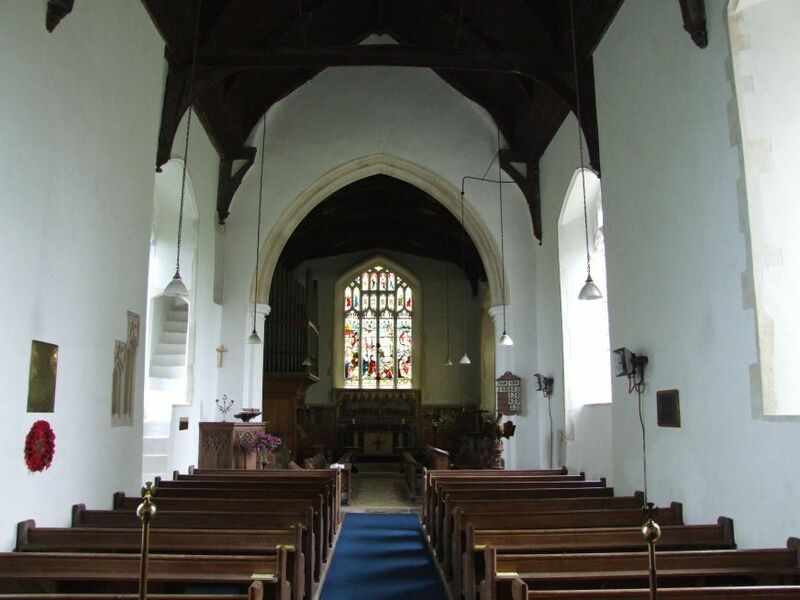 The nearest chapel was in Hoxne, but that attracted barely thirty people on a Sunday morning. The census noted that there were five Baptist families in the combined parishes, but that was all. It seems more likely that most people in Brome and Oakley simply didn't go to church in the middle of the 19th century. Anglican congregations generally rose during the second half of the 19th century, reaching a peak in the years after the First World War, before slowly falling away again. These years of plenty are often reflected in the furnishings and decorations, and that is certainly so here at Oakley. As I said, this church is now open every day, and you step into a very simple, humble building. 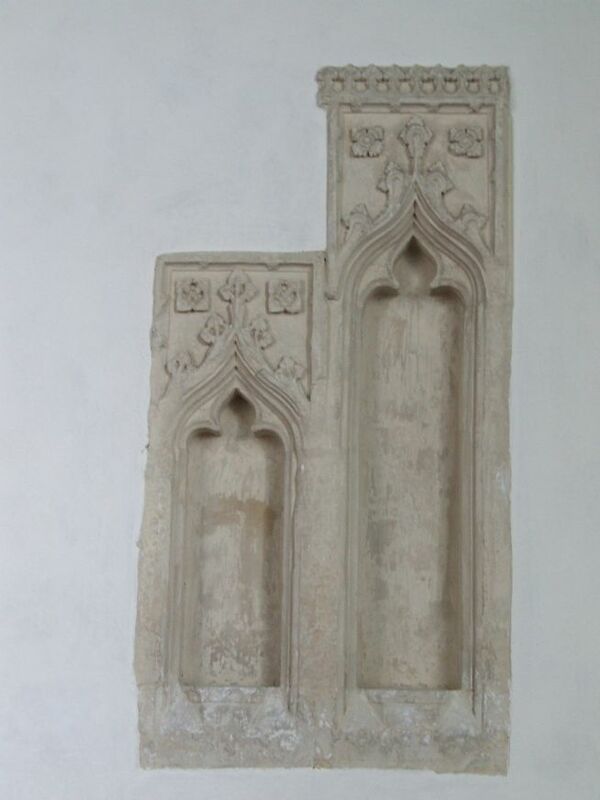 The font is very primitive, set directly against the north wall as was often the way before Victorian restorations. This feels a church of the ordinary people, as ordinary as Brome's church is extraordinary. And yet, the wealth of Paterson and the Kerrison family is felt even here, for there is a very good range of glass in the south and east windows, and another grand reredos in the sanctuary. If Brome was Lord Kerrison's baby, then Oakley appears to have been George Paterson's. The subjects of the windows reflect a rather more intellectual approach, with figures of what must have been some fairly obscure Saints in the late 19th century, including St Denys and St Longinus. Best of all, the large figures have been given the faces of members of the familes of George Paterson and his wife. 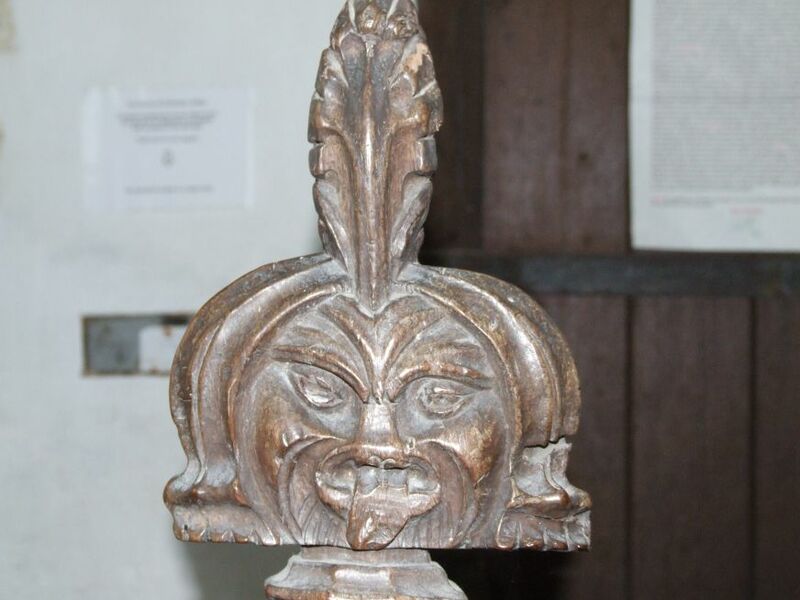 Most striking is probably St Denys, who has the head of Mrs Paterson's brother. The best glass of all is the Presentation in the Temple; it's breathtaking. Anna is Paterson's mother, and perhaps Simeon is his father, or even Paterson himself. St Nicholas is a church which does not shout, or wear its treasures on its sleeve. As if acknowledging this, two empty image niches on the north wall are beautiful but puzzling. They look awkward, as if there should be a matching smaller niche on the right side. We'd normally expect a triple niche like this to contain a rood group, a crucifixion in the middle flanked by the Blessed Virgin and St John. But what if there were only ever two? 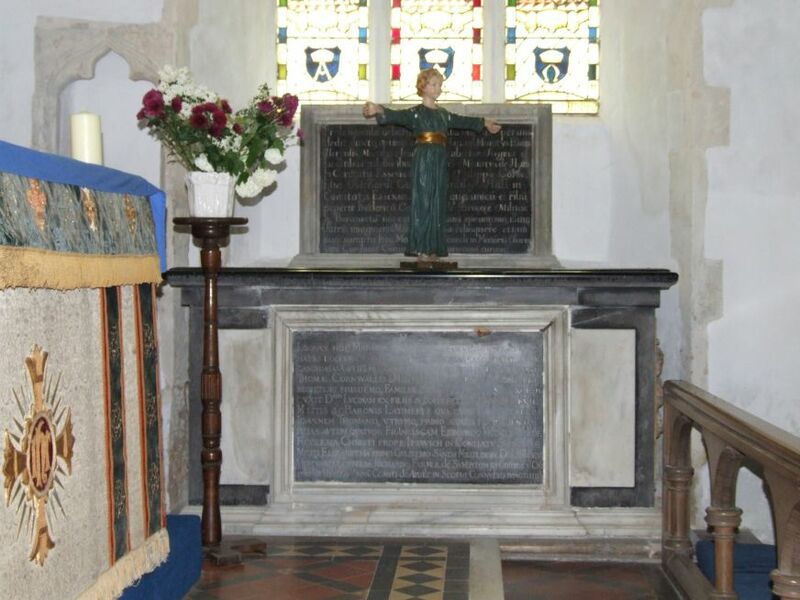 Up in the sanctuary is a simple early 17th memorial to Sir William Cornwallis. This is a fairly typical piece of the period, with the required amount of puritan piety, unlike the extravaganza to his father Thomas at Brome - but Thomas had died a Catholic, just seven years before his son. 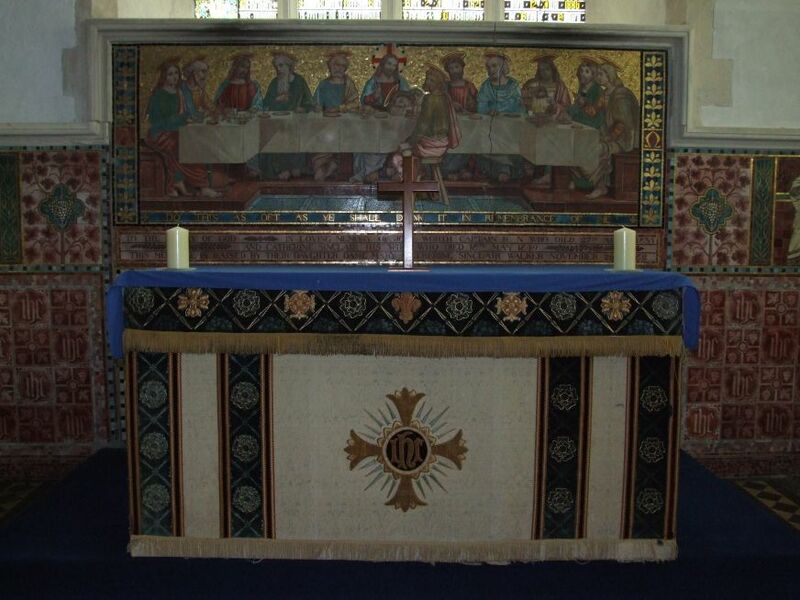 The gilt reredos was given by the Walker family, who are also remembered by the HMS Captain memorial in Hoxne church. It depicts the last supper, and is so languid that St John appears asleep, with his head on the table. Perhaps that is fitting, in this beautiful, sleepy place.